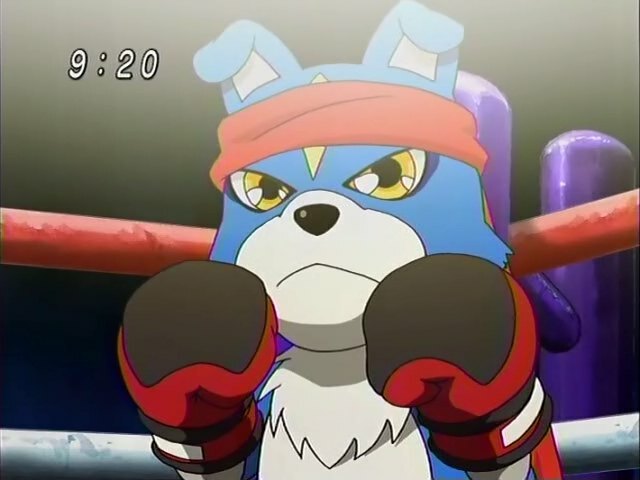 In this episode, Thomas's favorite boxer is suspected of using a performance enhancing Digimon. Corruption in boxing? Perish the thought! This week on CSI: Tokyo, the Data Squad is investigating somebody who may be abusing a Digimon's powers in order to secure fame and/or fortune. Is this getting repetitive? Naw, it's only the third time they've used this plot. Unless you count the kid that didn't want to feed the rabbits... which was pretty much the same thing. Repeating this same angle over and over again almost makes you long for the endless streams of kids getting into trouble and getting bailed out by previously unforeseen evolutions. Or Koji. That's what we have to be asking ourselves at this point. The early episodes of Data Squad are decidedly Not Good. The conflict is always against a Digimon either helping a human out or causing random destruction. There isn't any real character development going on, nor are we learning a whole lot about any of the three (we learn as much about Thomas this episode as we learned about Yoshi last time). None of this is advancing the main plot. Or rather, none of this is getting us anywhere closer to introducing the main plot. Episodes 6-8 seem to be par for at least throwing us a bone plot-wise. Devimon and Grumblemon show up for the first time. The Digimon Emperor's identity is exposed. Takato has to deal with the ramifications of Guilmon's evolution. None of these are great episodes, nor do they signal a rise in the action (or the quality), but they all serve to take us away from the starting line. We don't get anything like that this season. The run of monotony continues right up until the point where the series takes its first major turn (equatable to Juggernaut's activation and deaths of Angemon and Seraphimon). What's worse is that Lalamon and Gaomon already had established Champion forms, so we can't even pretend to be excited about Sunflowmon or Gaogamon showing up. Not that there would ever be a reason to be excited about Sunflowmon. In its own sad way, this episode provides an example of the season's maturity that previous episodes haven't quite sold us on. It's mature in that it plays more like a primetime police procedural than a cartoon about adventures with monsters. Marcus and Sampson suspect that a past-his-prime boxer is getting help from a Digimon. The Data Squad investigates, tracks suspects and pieces together a solution in time to bust Togemon. If you're into that sort of thing, it holds up just fine. Thomas's character is probably better suited for it anyway. A lifelong fan of this boxer, he investigates his own way- exercising at Harris's pace and sparring with him long enough to know that he's both washed up yet still determined to succeed. Like Yoshi last episode, Thomas puts any personal sentiments aside and does his job, never quite revealing what his personal sentiments actually are. Is he relieved that Harris was not involved in Togemon's activities? Is he disappointed that he was responsible for his boxing hero's downfall? It would have been better if Harris really was involved; then Thomas could have just had his angst and we could all leave happy. May have even lived up to the “never meet your heroes” title. If you're expecting adventure and excitement, however, this one's kind of a snoozer. There's a lot of shots of Yoshi on stake outs and interviewing family members. Marcus manages to sneak into the gym and get accepted as one of the bums, an impressive feat, yet it feels completely without drama. 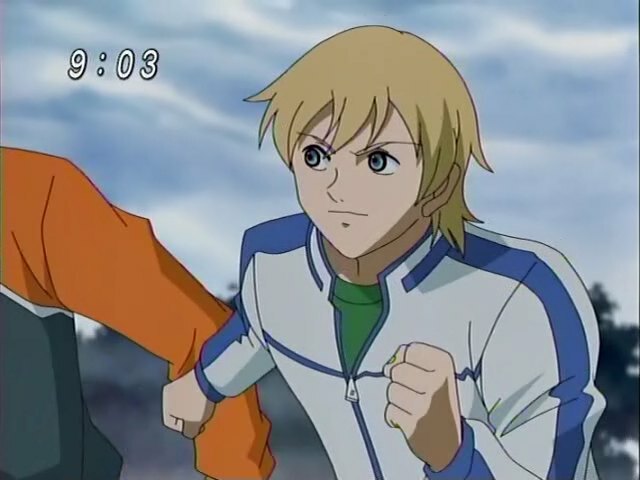 Even when he's tailing the trainer, it's quickly exposed as a misunderstanding. Rocky's just sneaking into his soda stash. Now if it was milkshake there would have been drama. Marcus, just based on his intuition and passing knowledge of fandom, predicts this entire situation. Nobody gives him any credit for having such a good hunch, despite reasoning that makes it more than just Davis-like foresight. 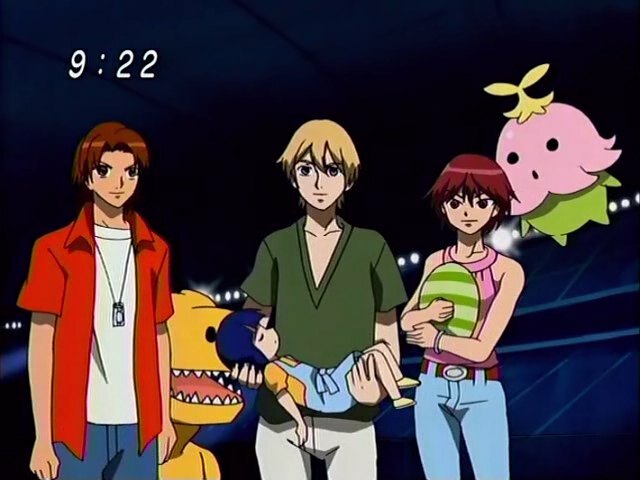 If they recovered a thorn that the lab reported as being from a Digimon, couldn't they narrow down the types of Digimon substantially? It shouldn't be too much of a stretch to assume a cactus with boxing gloves has an interest in boxing and leaves thorns at the scene. The trainer's name was Rocky. That's sort of cute, yet trite and obvious at the same time. Thomas carries a vibe of putting his feelings aside and taking care of business until the end when he insists on sensationalizing Gaomon's fight with Togemon as much as possible. Like it's not good enough to kill Togemon, but he also has to embarrass him for adding a black mark to Harris's career. Data Squad Episode 13: The Rise of Rizegreymon! Data Squad Episode 11: The Vile of Vilemon! Data Squad Episode 06: The Ultimate Team No More?